New figures are on the way from Square including some very nice (and a bit pricey, but worth it) Kingdom Hearts Figures. 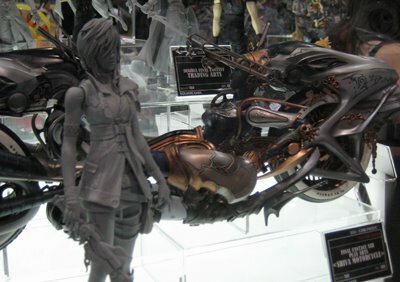 Other figures on the way include FFXIII figs, like the incomplete one shown in the pic above, a stunning $1000 FFXII Gabranth 1/1 helmet (seen in a previous post), and most likely more from the Final Fantasy VII line. Otaku got more to be excited about but hopefully they come out here by x-mas...chances are late January will be when they are all available outside of Japan. I hope they make a good one of that Rushi girl from FF13. I would so totally buy it even if it were just average though. Fanboygasm. Also Chuck exchange links? I moved and will like to update, thanks. I agreed on the Rushi figure. Now here is hoping they make a good Rushi girl figure lol. Nice to meet you! My Name is online banya says. If you like animated cartoon world's favorite people and would like to talk about the same. Permitting the link to my site. Thank you. Thanks,Thank you add to the sense.